One of the most common forms of mold found in many homes is known as Alternaria. You may know exactly what it looks like, typically characterized by its velvet-like texture and dark green and brown coloring. Alternaria mold tends to grow where ever dampness occurs, and throughout the average home, this could be a number of obvious places. It’s a hyper-allergenic mold, meaning long-term exposure can lead to respiration problems in the upper respiratory tract, nose, and mouth. So if you’re wondering what the exact causes of mold could be in your home, we outline it all in this blog. Mold can grow just about anywhere but is most commonly found in areas such as bathrooms, kitchens, basements, cabinets, and near pipes or ducting areas. It only needs a few elements to grow and proliferate throughout your home, the key element being moisture. Mold behind drywall may be one of the most common household problem areas as drywall, wood, and cotton are ideal food sources. Ceiling mold is also highly common due to a lack of ventilation and accumulation of moisture. If the temperature is right, there is a moisture source and enough oxygen, you can be sure mold will begin to grow and spread. If you live in an area where humidity is consistently high, you may have a problem with mold. This is only natural due to the high moisture content in the air. This type of mold will most likely grow on walls, ceilings, in dark closets, under the kitchen sink, etc. Mold caused by humidity is especially common if you live near the ocean or a large body of water and could also be worsened by a lack of ventilation. Moisture build-up in the air indoors could massively increase mold growth, so make sure to ventilate your home well, especially in the warmer months. 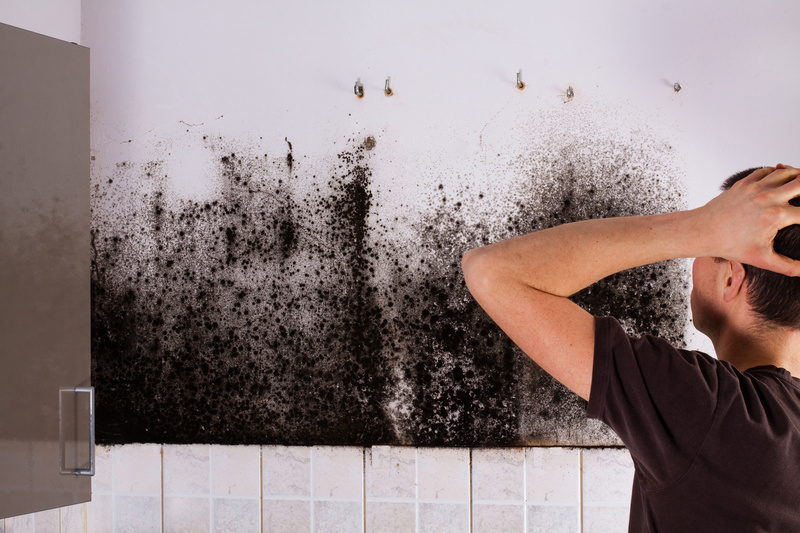 This is one of the most common causes of mold behind drywall and in under-sink cupboards. Leaking pipes can also contribute to ceiling and wall mold, as a leak could be coming from the geyser or piping in your roof. If you notice a build-up of mold in any of these areas, the natural choice would be to check your piping for leaks! A roof which is partially damaged due to wear and tear or severe weather conditions can quickly lead to mold build-up in your home. Over time, a slow leak can build-up a huge backlog of moisture in your ceiling or attic. This can eventually proliferate into mold that grows on walls and ceiling boards. Make sure to check your attic or the tiles and facades of your ceiling for damage and potential leaks to avoid a mold problem in your home. During the winter time, some homes may experience a build-up of condensation on cold surfaces due to the fluctuations in temperature. Some of these cold surfaces include metal piping, concrete surfaces, floor tiles and even brick walls. If you notice that condensation build-up is a real problem in your home, make sure to ventilate each room properly in order to remove the condensation. Otherwise, these condensation pockets are prime real estate for mold spores and the proliferation of mold growth. As we mentioned before, a poorly ventilated home is a magnet for the growth of mold and the spreading of mold spores. The stagnant air throughout your home is one of the best environments for the growth of mold. So make sure to rid your home of it on a daily basis! Steam created by appliances, cooking, and bathing creates humidity in your home, leaving surfaces damp and sticky. Remove the moisture from your home and you’ll remove the likelihood of mold growth. Picture this: you’ve just done a load of washing, taken it out of the washing machine, and set it aside to hang up later on. But you forget and the damp clothing sits for a full day, if not more. Believe it or not, mold only needs 24 hours to grow and proliferate. During the warm months of spring and summer, wet or damp clothing lying around your house can greatly contribute to an existing mold problem. So remember to hand your washing ASAP! Unfortunately, one of the realities you’ll face after you experience the drama of home flooding is mold growth. Your home will typically take days, or even weeks, before it’s completely dried out after a flood, so this makes the ideal environment for mold to grow. What’s more concerning is that this environment can also lead to the growth of dangerous, toxic mold known as Stachybotrys chartarum. You will need to bring in a mold cleaning expert after your home has completely dried out for mold testing and a thorough inspection. Due to the fact that they are below ground level, it’s only natural that a basement is exposed to higher levels of moisture. They are also more likely to contain greater levels of humidity due to a lack of ventilation or poor circulation of air. As such, this combination of both dampness and increased humidity will lead to the growth of mold. Water leaks from your home above may also accumulate in your basement. This is why you should keep your basement well-maintained in order to prevent a dangerous mold outbreak. If the slope of your yard has been landscaped in such a way that water fails to drain away from your house, you could have a mold problem on your hands. Rainwater and garden moisture can slowly trickle and pool around the foundations of your home, contributing to the growth of mold on walls. A landscaping expert can help modify your yard and its slope. Alternatively, drains can be dug out to direct water away from your foundations. Most homes throughout the country feature an air conditioning system, which can bring with it the growth of mold known as Mucor. This is an allergenic type of mold which grows quickly into thick, white patches below leaking air conditioning systems or due to condensation build-up. Make sure to check your air conditioner piping, ducting and filters to ensure there are no leaks or a build-up of moisture. Looking for Mold Removal Specialists? With over 25 years of experience in the industry of mold removal, we are proud to say we are one of the best in the business in Toronto and GTA. If you’re looking for a free mold inspection, information on the causes of mold or mold removal tips, we’re happy to help! Get in touch with Clean First for unrivaled experience, professionalism and mold removal expertise.